There are facilities on the train to ensure a comfortable train journey. There is a dining car in the middle of the train. Food is supplied at the dining time. Besides, a food cart will be travelling across the carriages. There is a drinking water dispenser at the end of each carriage. Hot drinking water is available. Passengers have to take their own cups to get water. Usually there are two or three washbasins with a mirror on the wall at the end of each carriage. 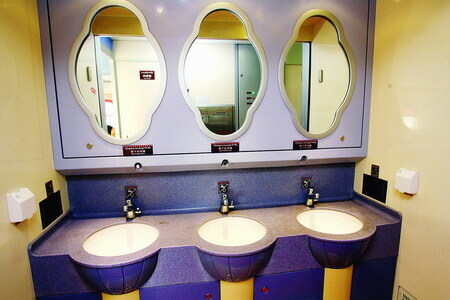 Passengers have to take their own toiletries. Toilets are usually near the washbasins. Most are squat type without toilet paper. The red sign indicates that the toilet is occupied and the green sign indicates that the toilet is available. When the train arrives at a station, the toilets will be closed. Electricity will be available starting from January, 2014. The voltage is 220 V.
It is not allowed to smoke in the carriages. 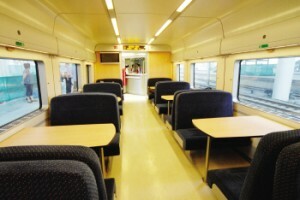 However, there is smoking areas between every two carriages.